Racial clashes and violence may have erupted in Charlottesville this month over what to do with monuments to the leaders of the old, slave-owning Confederacy — but what about the statue of a self-proclaimed segregationist in Michigan? Even up in northern states, communities are grappling with how to deal with the remnants of difficult histories. 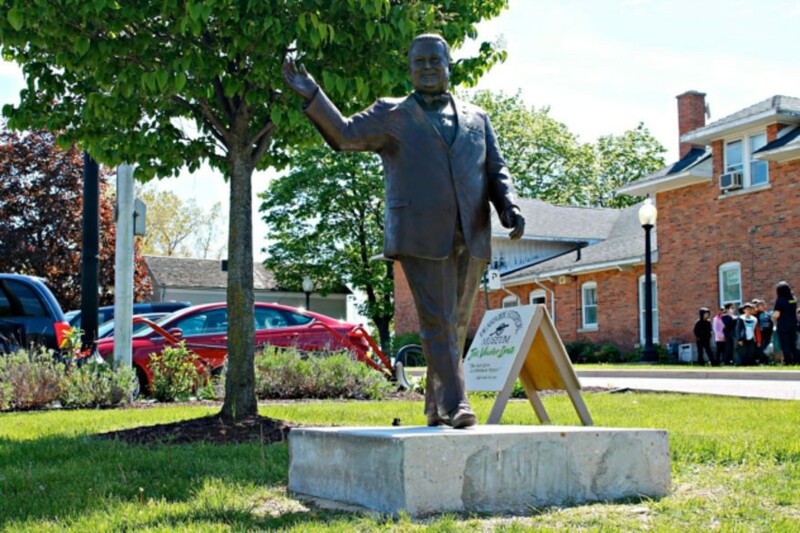 A statue of Orville Hubbard, Dearborn’s longest serving mayor, stood in front of the city hall from 1989 to 2015, until it was placed in storage when the company Artspace bought the site. Yet when the relic suddenly reappeared at the entrance of the Dearborn Historical Museum on Brady Street in March, public outcry and debate followed. Hubbard, who served from 1942 to 1978, was known for keeping the city clean and making sure families had places like Camp Dearborn, but he was also staunchly against integrated housing and was one of most outspoken segregationists north of the Mason-Dixon line. Current Mayor of Dearborn Jack O’Reilly told residents at the April 11 city council meeting his administration was behind its reinstallation. In June, Third Circuit Court Judge Susan Hubbard said the city felt obliged to put the statue of her grandfather back up, because it was a gift to the city commissioned by his supporters. Lois Gueli, who’s called the city home for the past 31 years and lives six doors down from the museum, expressed concern regarding the monument. She says Hubbard was, and is still, a symbol of suburban America’s resistance to racial integration. “To me he’s not welcoming people into the museum. To me, he’s welcoming people into my neighborhood,” Gueli says. In response to concerns from constituents, Andrew Kercher, assistant curator at the Dearborn Historical Museum, says O’Reilly met with a group of stakeholders (including museum curator Jack Tate and residents who had voice concerns), to discuss a new location. Hubbard was moved to the north of the McFadden-Ross House nearby. Kercher says it’s only about 50 feet back, but passersby no longer see it from Michigan Avenue. The Orville Hubbard statue standing in front of the Dearborn Historical Museum, before it was moved tis new location approximately 50 feet back. 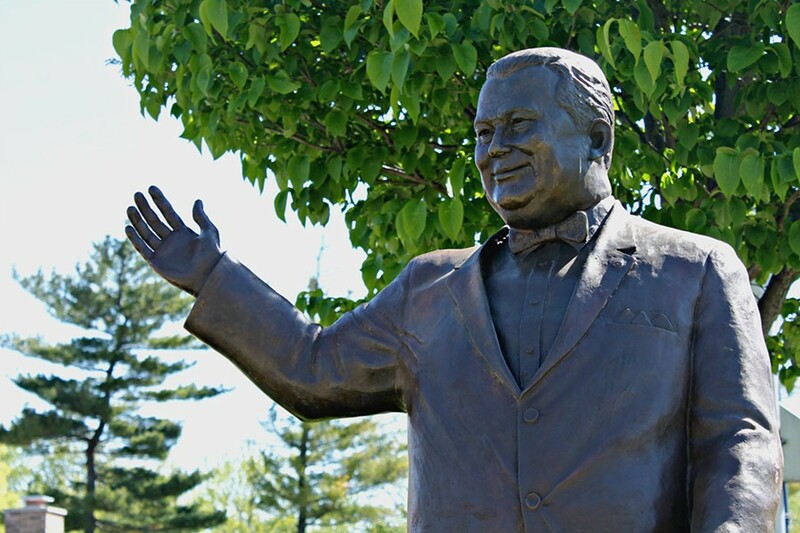 However, Kercher takes issue with the fact that the statue remained unmarked, and drafts of the proposed signage given to the museum by city hall gave no reference to Hubbard’s notorious views on race. Longtime city resident David Good, member of the Dearborn Historical Commission and author of Orvie: The Dictator of Dearborn: The Rise and Reign of Orville L. Hubbard, submitted updated wording for a sign to accompany the statue, because he says the original signage at City Hall sanitized history and gave no mention of Hubbard’s segregationist views. As cities across the nation focus on their monuments following Charlottesville, chair of the Historical Commission Glenn O’Kray says he and former chair Bill Hackett met with O’Reilly on Aug. 16 to discuss adding historical context to the statue. O’Kray said the mayor agreed to the city would use verbiage approved by the historical commission. The historical commission will convene for their monthly meeting Aug. 22, there they will go over the wording once more and conduct their final vote. Looking at the long-term, the city’s administration, the historical commission and the museum are all in agreement that Hubbard should be moved into the museum. “It cannot be accommodated inside until the museum has the money to create the space for it among what is envision to be a comprehensive exhibit of Dearborn’s overall history,” says Mary Laundroche, director of the department of public information. Kercher said Orvie would be a centerpiece in an exhibit about the social and economic history of Dearborn, where his role in shaping the city today can be properly and thoroughly explained. A petition is being circulated by the Historical Commission to get a millage proposal on the August 2018 ballot. If passed, Kercher says it would generate about $6 million over five years for the museum and allow the museum to renovate their office and storage building. “By putting it at a museum, you are recognizing that it was something in your past, and it gives us the opportunity to reflect on the past in an honest way, so that we don’t make the same mistakes that have been made,” O’Kray says. The petition needs 3,500 signatures or the decision to put the millage on the ballot will go to the city council. This story was the result of an project by Wayne State University students working with longtime investigative reporter Joel Thurtell. Aleanna Siacon, Ali Berro, Jared Hoehing, Jacklyn Price, Clara Ruffin, and Jordan Works contributed to this story.